One pair of platinum and 18 karat yellow gold bow motif earrings. Two old European cut diamonds (0.57 carats: SI clarity: G-H colour). 100 single cut diamonds (2.00 carats: SI-I1 clarity: G-H-I colour). 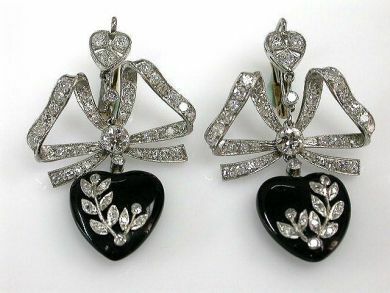 Two heart shaped black onyx pieces. The onyx is inlayed with foliage set with diamonds.